PokerStars Sunday Million 5th Anniversary - Win a Ferrari! PokerStars, the world’s leading online poker site, marks the fifth anniversary of its popular Sunday Million poker tournament on March 6, 2011. The tournament begins at 4:30 p.m. Eastern Standard Time on March 6. PokerStars is celebrating the anniversary by making the Sunday Million, already the most prominent weekly tournament in online poker, even bigger and more lucrative. 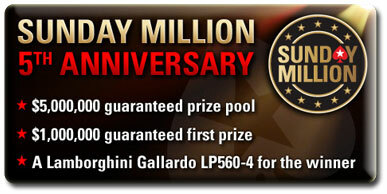 The fifth anniversary Sunday Million tournament features a guaranteed total prize pool of $5 million. Players will be competing for a guaranteed prize of at least $1 million for the first-place finisher in the event. As an added bonus, PokerStars will award a brand new black Lamborghini Gallardo LP 560-4 to the winner of the fifth anniversary Sunday Million tournament. Powered by a newly engineered 5.2-liter V10 engine, the Lamborghini Gallardo LP 560-4 is one of the world’s most prestigious and powerful sports cars. It has a base price exceeding $200,000. As they can each week, players may buy in directly to the Sunday Million tournament for $215 if they wish to enter by that method. PokerStars also offers a wide variety of satellite tournaments that players can enter to try to win their way into the big event. Special satellite qualifier tournaments for the fifth anniversary Sunday Million at PokerStars start with entry fees as low as $1. PokerStars will also mark the occasion by offering a unique $11 turbo super satellite tournament at 2:30 p.m. Eastern Standard Time on March 6. This tournament will award a guaranteed total of 1,000 seats in the fifth anniversary Sunday Million event. Feeder satellites into the $11 turbo super satellite are available at PokerStars with entry fees as low as $1. PokerStars players also have the option of buying into the Sunday Million for 13,500 Frequent Player Points in the VIP Store at PokerStars. New players can sign up with PokerStars marketing code 2013 “PSP1913”.